Carb-loading is real (to an extent). That plate of spaghetti your mom always made for you before your big middle school basketball game that night wasn’t all for naught. Carb-loading really does give you the energy you need to give a workout your all, but for those of us who aren’t training for a marathon, it doesn’t necessarily mean downing a plate of noodles for dinner before you work out the next morning. 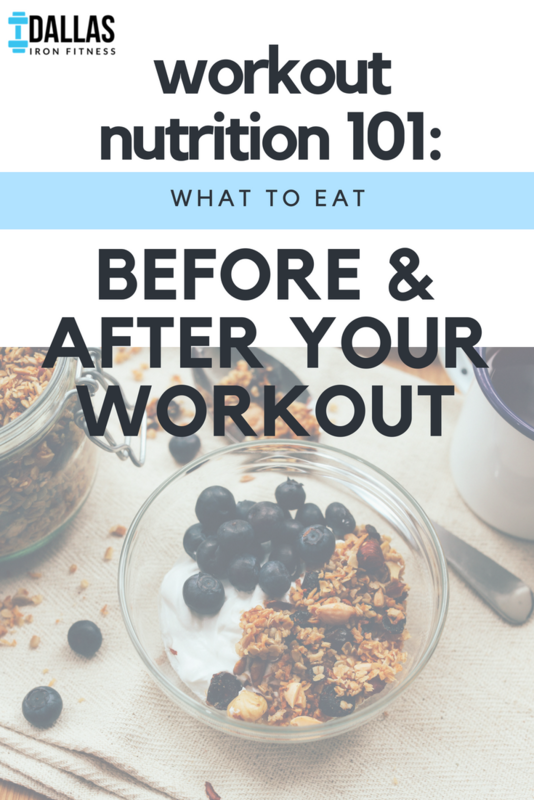 Examples of this would include 1 cup of whole grain pasta, brown rice, quinoa, or beans/lentils with your dinner the night before a morning workout. If you weren’t able to incorporate a carb source at dinner, you can snack on something small before bed to get in your carbs: fruit with nuts, apple and peanut butter, or Greek yogurt (go for the unflavored kind, as flavored yogurt options are way high in sugar) and berries. If you are working out after work, include a carb source for your breakfast, like 1 cup cooked oatmeal with fruit. A note on nuts, seeds, and nut butters: the recommended serving size is 2 tablespoons, so be mindful of this so you don’t over consume! When you strength train, you’re creating small tears in your muscles—your cells then repair these, thus creating stronger and bigger muscles. But your body needs protein to make this happen. “The majority of people get plenty of protein in their diet to meet their needs, however, we still want to make sure we are combining the protein with the carbohydrates for adequate muscle rebuilding,” says Erin. When planning your pre-workout meals, keep in mind that a serving of meat per meal is 3-4 oz.—”about the size of a deck of cards,” notes Erin. You can also get your protein from other, non-meat sources: nuts/seeds, eggs, low fat cheese, and Greek Yogurt (which also has carbs—double win!). Meal timing is as important as the meal itself. While you need carbs and protein to make the most of your workout, a full meal right before your workout is going to hurt your stomach more than help it. To fully maximize your workout, you should eat a full balanced meal, including your carbs and proteins, 3-4 hours before your workout. Can’t fit in a full meal? Don’t worry, “a small meal is sufficient to fuel your workout 2 - 3 hours prior,” says Erin. Make sure to incorporate carbs and proteins in your meal, as explained above. Seriously though. A workout can quickly sour without proper hydration. (And no, drinking soda does not count as staying hydrated.) Dizziness, nausea, muscle cramping all can happen when you’re going hard at a workout without enough water to keep you going. Though each body has different needs, a good rule of thumb is to start with 2 glasses of water 2 - 3 hours before your workout and then 1 glass of water right before your workout, about 10 to 20 minutes before you begin. You don’t want to overdo it though, either, as too much water right before intense physical activity can upset your stomach. So don’t down 4 glasses of water right before you walk into your HIIT class. Get a boost of energy with Advocare Spark. When we need a boost of energy before a workout, we love to use AdvoCare Spark, “a unique blend of 20 vitamins, minerals and nutrients that work synergistically to provide a healthy and balanced source of energy.” We love the convenience of the Spark Stick Packs, allowing us to throw one in our gym bag to mix in with our water pre-workout. And they come in any flavor you could want: pink grapefruit, watermelon, cherry… the list goes on! We’re a proud AdvoCare distributor and supporter of their health products! You can check out our store here. Your body needs to eat after a workout, so don’t blow this off as unnecessary! Your post-workout meal should have the same emphasis on carbs and proteins as your pre-workout meal to restore muscle and glucose levels. However, for most average exercising and weight-training individuals, you are fine waiting until your next meal if it is within 1 - 2 hours of exercise; only those who are an athlete or training for something in particular will need to eat immediately after a meal. Otherwise, bring along some healthy snacks (see above for examples!) to tide you over until your next meal. Another shout out to water: you’ll also need to rehydrate, so re-fill your water bottle and get sippin’! Get fit when and where YOU WANT. With our online fitness program, you’ll receive workouts directly to your inbox, so you can plan your exercise around your own schedule. You’ll also receive online guidance from your own fitness trainer, giving you accountability and advice to walk you through your workouts.